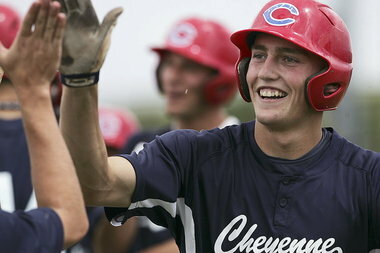 Although it went down to the Monday, Aug. 15 midnight deadline the New York Mets signed first-round pick Brandon Nimmo, a high school outfielder from East High School in Cheyenne, Wyoming. The first-ever first-round pick from that particular state agreed to a reported $2.1 million signing bonus. The 13th overall pick played American Legion ball because his high school doesn’t have high school ball. He hit .551 with 14 homers, 99 RBI and 33 stolen bases this year and helped Post 6 win its third straight state title. His Legion coach, Tagg Lain, told Kevin Kernan of the New York Post that he sees Nimmo as ultimately becoming a cross between Paul O’Neill and Josh Hamilton and that he compares favorably to 2010 overall No. 1 pick Bryce Harper. Well the 17-year-old has a little work to do. The 6-3 lethanded hitter was just 3-for-15 – all singles – with no walks and five strikeouts in his first three games at the rookie-level Gulf Coast League. He’s 0-for-4 with three strikeouts against fellow southpaws. Things keep looking up for Matt Harvey. The 2010 first-rounder struck out five over seven scoreless innings Monday as the Class AA Binghamton Mets beat Erie 2-0. He walked two and faced just 24 batters while improving to 4-3 with a 4.35 ERA for the B-Mets. Harvey has won his last four starts, yielding six earned runs, 18 hits and five walks with 21 strikeouts in 22 innings. He leads the Mets with 12 wins, ranks 13th in the Minors with 151 strikeouts and sports an overall 3.17 ERA with a .251 average against. AROUND THE MINORS: Highly-regarded 18-year-old Juan Urbina had his best outing of the season last week, pitching six scoreless innings for Kingsport of the rookie-level Appalachian League. The 6-2, 170-pounder, the son of former major leaguer Ugueth Urbina, yielded five hits with two walks and three strikeouts to improve to 3-5, 5.83 ERA for the season. … Class AAA SS Jordany Valdespin hit his first homer for Buffalo, a three-run, go-ahead shot Saturday against rival Columbus. He drove in three runs Monday in a 6-4 win against the Clippers, lifting his average to .236/.259/.364 in 13 games. … 3B-1B Zach Lutz is hitting .378 with four homers and 12 RBI in his last 10 games for the Bisons, lifting his OPS for the season to .936. He’s hitting .341 with runners in scoring position.